I believe this has only recently been renamed Hansford Hall. It was built in 1913; J. F. Moorefield was the architect. 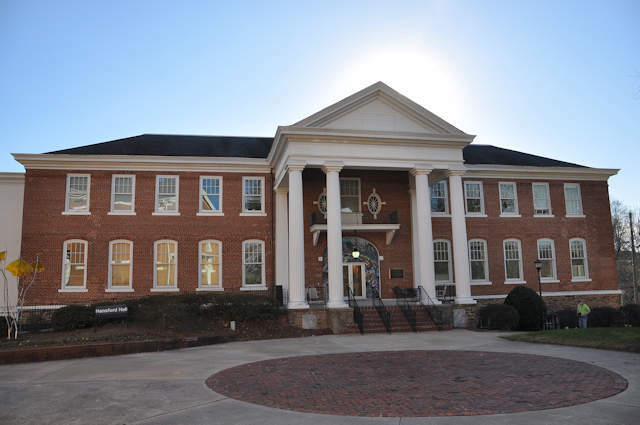 Brian, this handsome old building was recently renamed Hansford Hall in honor of Nat and Francis Hansford. Nat retired as college president several years ago. It may be of interest that Nat and Francis now own and reside in the Stephen Upson house in Lexington which you featured in a previous post. Thanks, Ben. Do you know the building’s original purpose? Also, I can’t find anything about the architect, Moorefield. I think it was previously called the Education Building but do not know if that means it was part of the schools teaching degree program. I also do not know anything about the architect, but found out the restoration/renovation work about 7 or 8 years ago was done by Millard Architects in Roswell. They might have done some historic research on the building. BTW, Millard’s web site says the building originally dates to 1894. The 2 story portico looks a little out of sync with the rest of the building…wonder if it along with additions could date from 1914? Thanks so much, Ben. Definitely worth more investigation. Maybe the 1913 foundation stone could have been from an expansion. I’ve got a lot m ore work to do with North Ga sites. Surprising sometimes how little is out there.